Australia’s largest battery has arrived in Buninyong, south of Ballarat, and will be connected to the grid in the coming weeks. 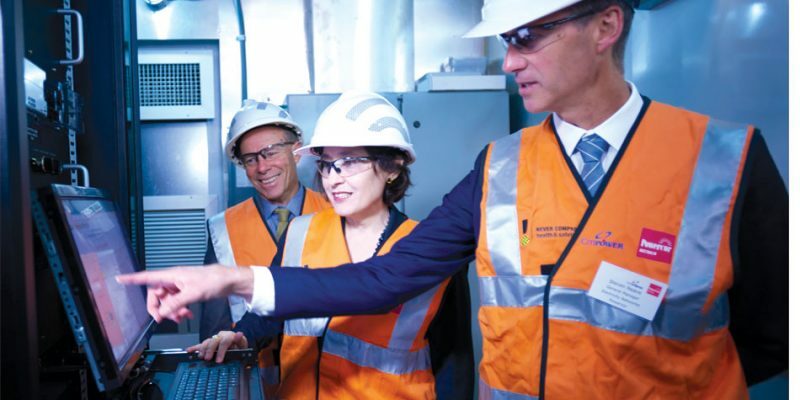 Victorian Energy Minister Lily D’Ambrosio stopped by the battery site yesterday together with Buninyong MP Geoff Howard and City of Ballarat Mayor Des Hudson. The 2 megawatt battery is capable of providing approximately 3,000 customers with an hour of back-up power during a power outage and is expected to reduce outage time for Buninyong residents to less than 33 minutes a year. A grid-scale battery installed on the right part of the network can help reduce stress on the network, improve reliability of supply and reduce maintenance costs. In her launch speech, the Energy Minister commended Powercor for its vision in exploring new technologies, saying the Department will be watching this trial closely. The storage system was manufactured in South Korea and recently underwent a series of intensive Factory Acceptance Tests (FAT) in Chicago.The battery rose to the challenge, withstood the tests and has arrived in Australia after a 3-week journey from the USA. More information, including a downloadable copy of our big battery brochure, is available here.